Metallica is not only the best-selling recording group of the last years1, but a typical American hard rock band as well, having its roots in San Francisco. Although this kind of music is considered to be raw, tough and sometimes even not melodic, the songs‘ lyrics can be very important and elaborate. This is especially true for Metallica’s lyrics. To show this aspect, I will deal with five of the band’s songs – „Welcome Home“2, „One“3, „…And Justice For All“4, „Enter Sandman“5 and „Until It Sleeps“6 – which were written for different albums within ten years and can therefore be used as typical examples for the band’s well-composed lyrics to show that there is a major theme, too. So I will first focus on poetry and language, and then, more generally, on theme. In the five songs which I mentioned above, I will try to identify the rhymes, the imagery, metaphors and similes and the language that is used in general. First, I will look at every single song, and afterwards, resulting from this examination, try to find a general basis for these observations. This song consists of two stanzas and a final part, a kind of envoy. It is made up of regular, paired rhymes; only in the chorus and in the envoy no rhymes can be found. A striking stylistic device in this song is the strong use of alliterations: „we will win“, „they think this saves us“ or even the first line „welcome to where time stands still“ with two w- two t- and two st-sounds. There are no real metaphors or similes, but another important stylistic device is obvious: personification. The „mirror stares back hard“, and the „brain says rage“. Additionally, there are many repetitions of words to make the theme clearer: „violent use brings violent plans“. The meter, at least in the stanzas, is four-footed, sometimes iambic, sometimes trochaic, but always with a stressed, male ending. Interesting as well is a structure of increasing tension from „freedom“ and „barred“ in the beginning to „breathe“, „violent“ and „tied“ in the second stanza to „mutiny“, „death“ and „kill“ in the envoy. So the vocabulary tends to be a very rude one; the song sounds like a nightmare. This nightmare aspect can be found in the language of „One“ as well, terms like suffering and pain come to the reader’s mind. In addition, terms from the fields of war, sickness and religion are used. Again, the song consists of two stanzas, chorus and envoy, and the meter is four-footed with male endings, so a general tendency can already be seen. The rhyme scheme is rather complicated, but normally, the stanzas are built of three similar sounds and then a fourth, unrhymed one. In the envoy, only the first two lines rhyme („me“, „see“), and then the last lines of the two parts to connect them („cell“, „hell“). Many off-rhymes are used as well, such as „anything“ – „dream“. In the chorus, there is a kind of internal rhyming: „hold my breath as I wish for death“ or „…is gone I’m just one“. Again, there are many repetitions, especially in the envoy, where the combination „taken my“ is repeated six times. In strong contrast to „Welcome Home“, „One“ contains many similes and metaphors, for example „just like a wartime novelty“ is a simile or „darkness imprisoning me“, „trapped in myself“ and „body my holding cell“ as metaphors. In these examples, personification is obvious as well, as „darkness“ and „landmine“ act like a person. This personification is even more obvious in „…And Justice For All.“ „Lady Justice“ is really seen as a woman who can even be raped, inquisition is seen as a human being and money can talk. This song is the best example for symbols in Metallica’s lyrics. The colour green stands for justice, and its „hammer“ is used as well. In this song, we have really strong imagery, including power as a wolf and money oppressing justice. Repetitions are there, too: „I can’t believe“. Again, the meter is four-footed, trochaic in the stanzas and iambic in the first part of the chorus, and its ending is male, so we have really a general tendency. New is the fact that the song consists of three stanzas and three choruses, and while the rhymes are paired rhymes, there is always an unrhymed line in between. Again, „Enter Sandman“ contains paired rhymes, sometimes even three rhymed lines in a row, and again and again the same sounds -ight and -and reappearing. Off-rhymes can be found as well as repetitions („dreams“), and the meter is four-footed, at least in the envoy, which exists in this song, too. More important in „Enter Sandman“ is the imagery, as Metallica use terms from fairy tales, „never never land“, the „sandman“, „beasts“ and „dragon’s fire“ as well as from religious aspects, but they use them to create a dark, nightmare-like vision where the sandman is no longer a positive figure. In this last song, we have again a four-footed iambic meter with stressed endings, slight alliterations, many off-rhymes and personification, as the pain „stays“, „hates“ and „sleeps“ and is even directly addressed. In addition, there are the similes „like the curse, just like the stray“. Interesting is the rhyme scheme. Only paired rhymes are used and repeated. The result is that the whole song needs only six different rhymes. After this examination, it is obvious that the way of writing the band’s lyrics seems to be very schematic. In almost every song we find two stanzas and an envoy, a four-footed meter with stressed endings, strong personification and repetitions, many metaphors, symbols and similes. The language uses parts from many contexts and combines them with sometimes raw expressions, so the poetry in Metallica’s songs can be considered to be a mixture of traditional elements of poetry and new themes which I will analyze in the following part. Looking at the themes of the examined songs, one can state at once that they are definitely not love songs. „Welcome Home“ deals with a mentally ill person who feels trapped in the sanitarium, „One“ tells us about a soldier who returned from war more dead than alive, „…And Justice For All“ accuses the misuse of justice. „Enter Sandman“ deals with the nightmares of everyone and „Until It Sleeps“ with fear in general. So the central themes are fear, injustice and – resulting from it – anger, rage and desperation. The way which is used to realize this is normally an apocalyptic vision, a bad nightmare. So the basic theme is the fear of every single being, and this basic theme is transferred to the more general context of injustice in society. Thus Metallica criticises society, especially the American situation, which becomes obvious in the topics of war, therefore politics, and the judicial system. This strong criticism is expressed very directly and aggressively, and – according to the lyrics – must end in rage, which is a questionable and maybe even dangerous aspect as it could be misunderstood. 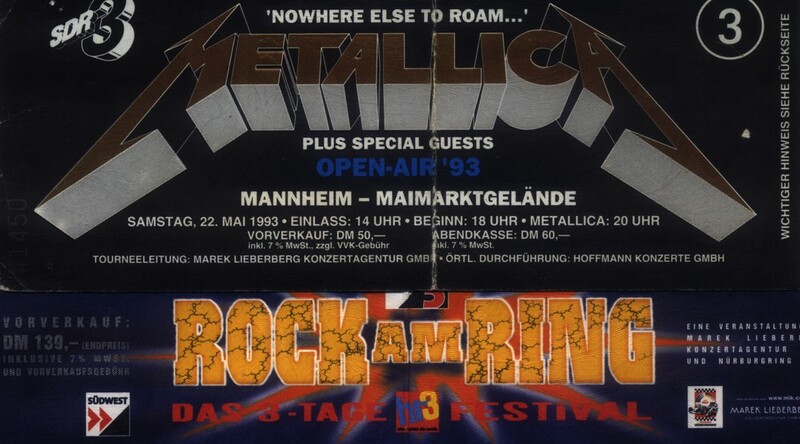 Therefore, although the special meaning of every single song is not always that easy to find out, it is obvious that there are indeed a general theme and a specific kind of poetry in Metallica’s songs. One can say that they try to criticize in extreme lyrics and extreme music. 1 Kai Holoch, „Alpträume vom Sandmann“, in: Stuttgarter Zeitung 270 (96), p.17. 2 Metallica. Master of Puppets. Elektra 1986. 3 Metallica. …And Justice For All. Elektra 1988. 4 Metallica. …And Justice For All. Elektra 1988. 5 Metallica. Metallica. Elektra 1991. 6 Metallica. Load. Elektra 1996. This paper will be published in the Internet on the webpage of a friend who keeps a Metallica homepage going. In addition, the paper will probably be mentioned in the official Metallica Club Magazine So What! and maybe on its webpage as well. Metallica. Master of Puppets. Elektra 1986. Metallica. …And Justice For All. Elektra 1988. Holoch, Kai. „Alpträume vom Sandmann“ in: Stuttgarter Zeitung 270 (96), p.17. Smith, Tony (ed.). So what! The Metallica Club Magazine. Knoxville, TN: The Metallica Club Inc.